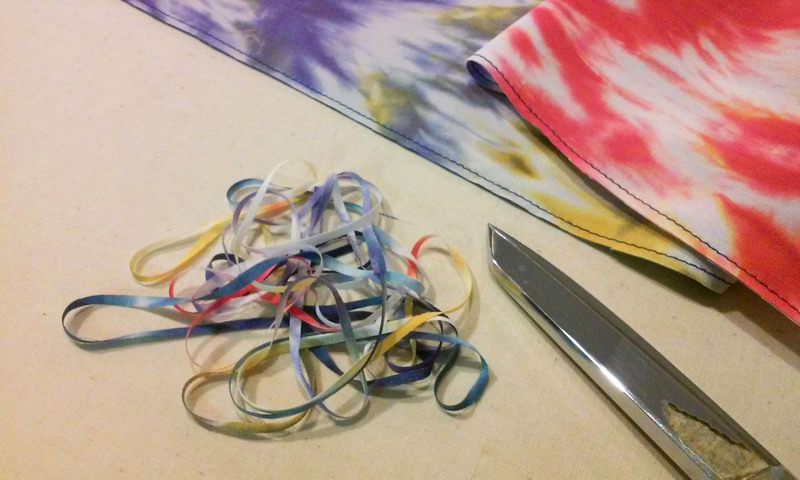 I love all of the fabric that I dye and I really hate to waste any of it, so I always save the small pieces of fabric that are left over after I cut out a garment. When I build up enough of them, I turn them into something new! 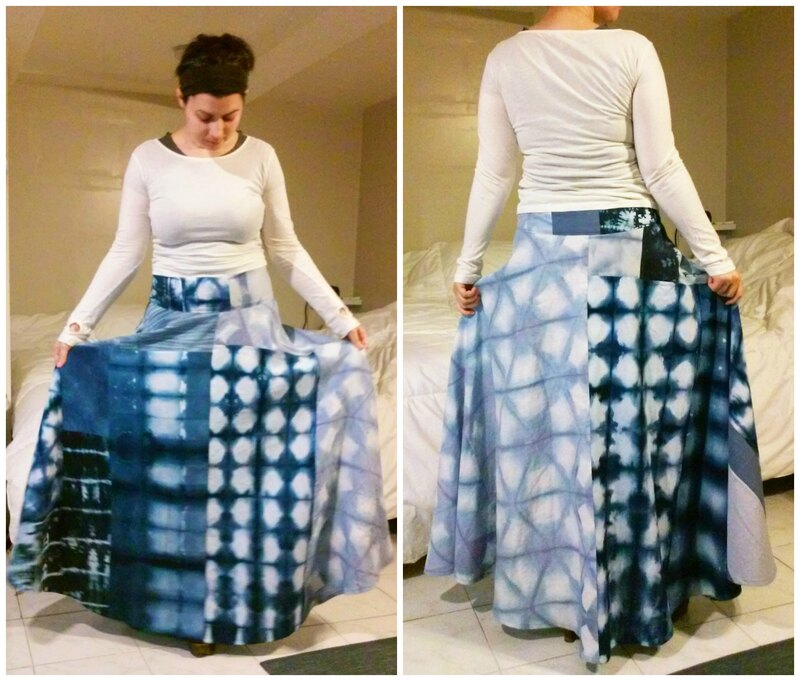 I had a bunch of pieces in various shades of blue, some of which were pretty big, so I decided to make a floor length skirt. I used my own pattern, which I draped a few years ago. It is a flared skirt with a wide waistband. 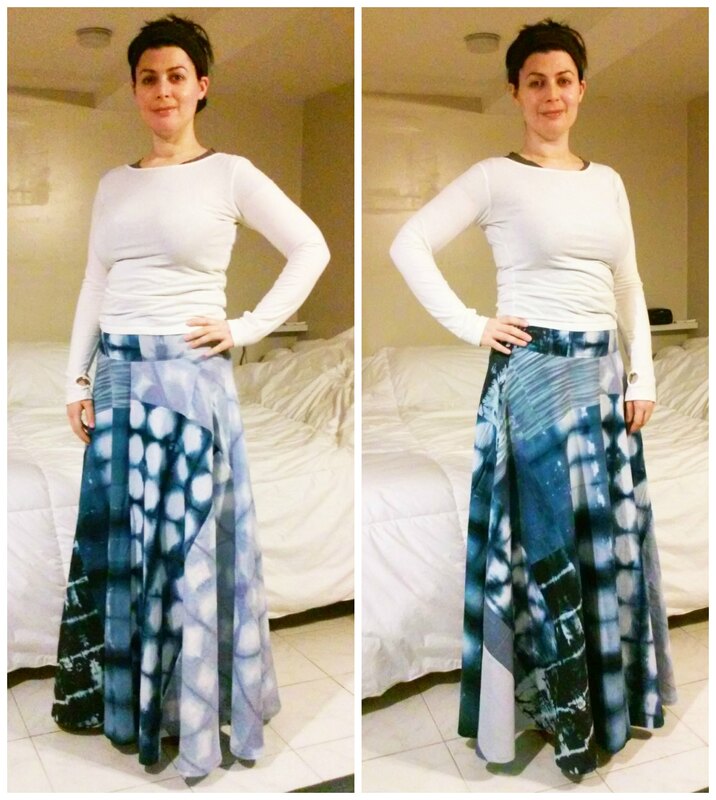 Originally, I designed the pattern as a wrap skirt, but for this project I didn’t have enough fabric for the overlapping layers, so I adjusted it to be a regular skirt with a side zipper. The inside of the skirt. 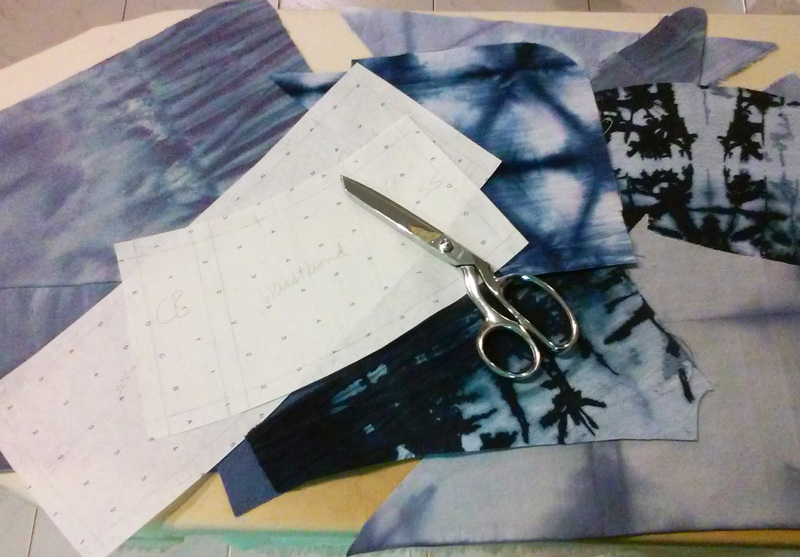 I pieced all of the scraps together with french seams. 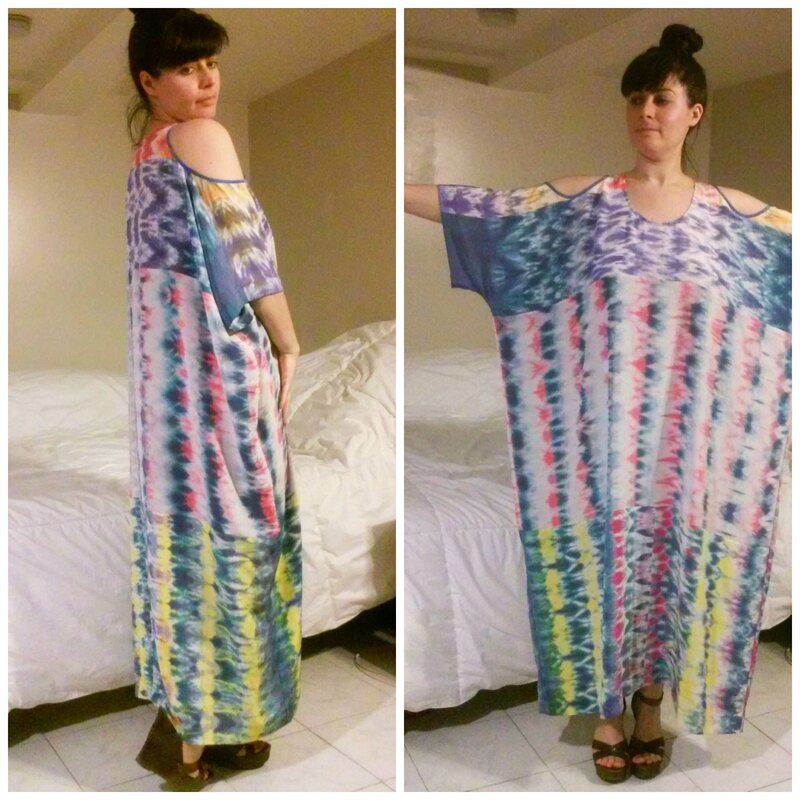 I followed the same basic procedure that I did for my shibori kaftan. I laid out all of the small scrap pieces on top of the paper skirt pattern until I got the best arrangement, then I sewed them all together into larger pieces to cut out the full front and back skirt. Then I finished the skirt as usual. The skirt at the half-way point. I was a little confused about how to finish the side seam with the zipper in it. I sewed the rest of the skirt together with french seams, but combining that with an invisible zipper just didn’t seam (get it?) to work. I looked up a few tutorials about inserting invisible zippers into french seams, but they all involved clipping into the fabric near the bottom of the zipper, and I wasn’t comfortable doing that. The zipper is a point of stress and if the fabric started to fray there I would be quite displeased. So, instead I decided to sew a regular seam on the zipper side of the skirt and finish the seam allowance with homemade bias binding! Piece of cake! I made sure to attach one of my labels, of course! 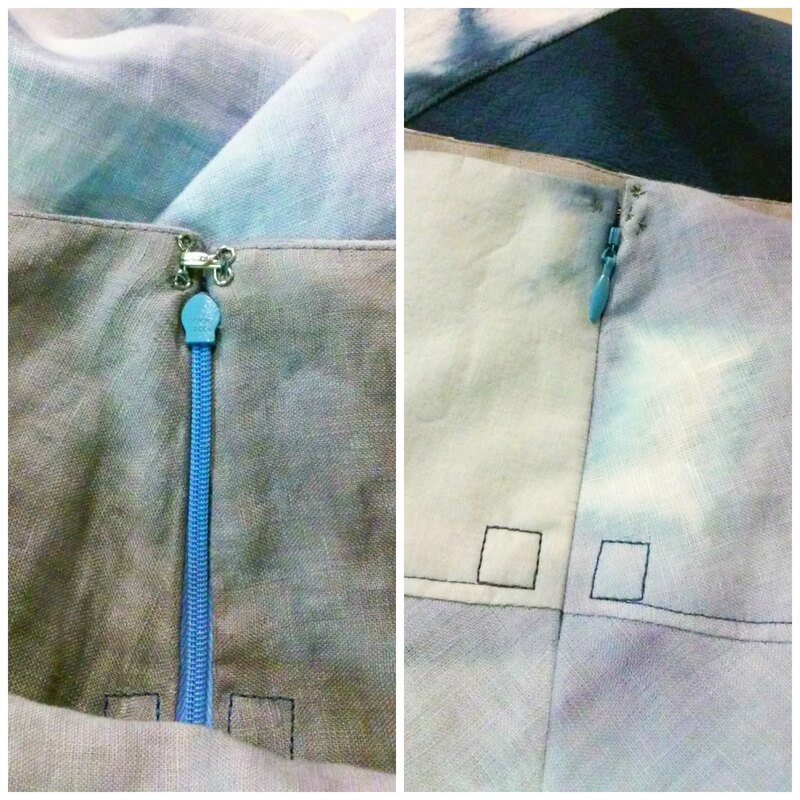 I installed the zipper, then finished off the inside of the waistband with a lining. 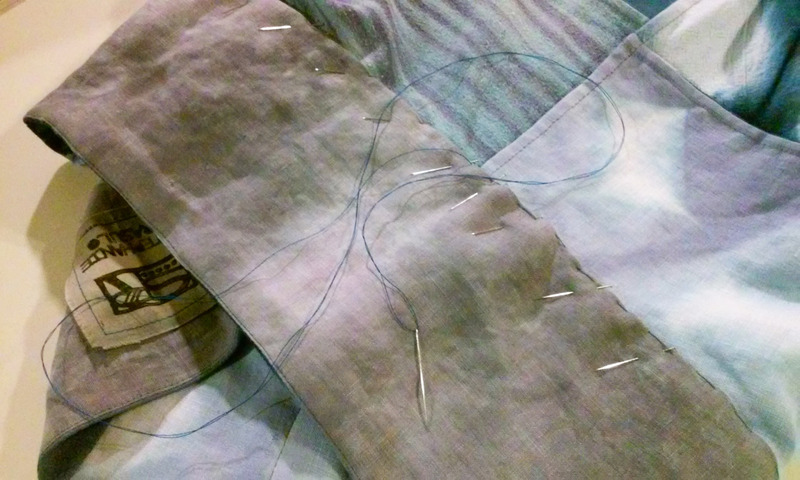 I basted the lining into place by hand and then machine sewed it from the right side to make sure the stitches were straight. Then I added a hook and eye to keep the zipper closed. And now it’s time for me to go to bed…goodnight! My fabric buying budget has been a little low lately, but I won’t let that dampen my zeal for sewing! Whenever I run out of new fabric I start hunting through my “archives” to see if there are any pieces that I can recycle. 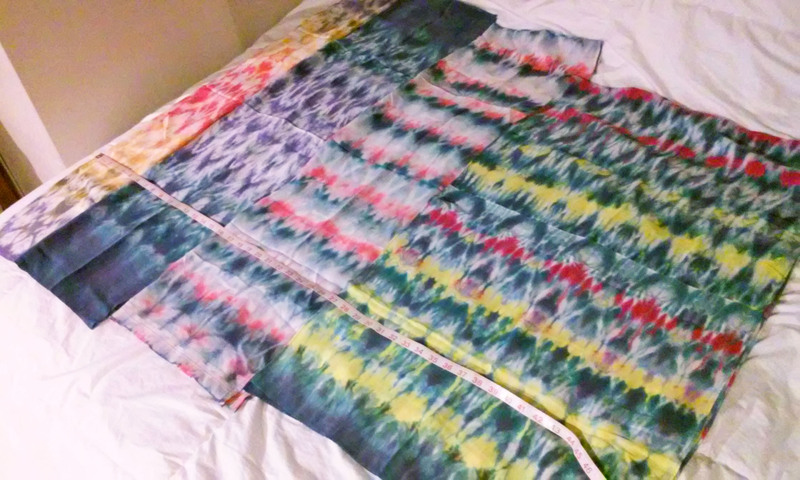 I found a few test scarves that I made when I first started experimenting with shibori, and I thought they might look cool pieced together into a colorful patchwork of some kind. 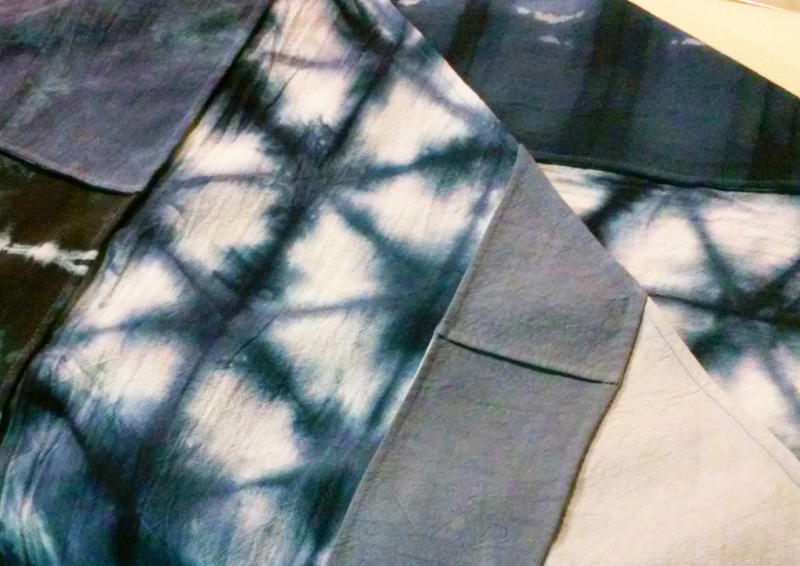 Close-ups of the shibori scarves. I laid out the scarves in different ways until I found a combination I liked. 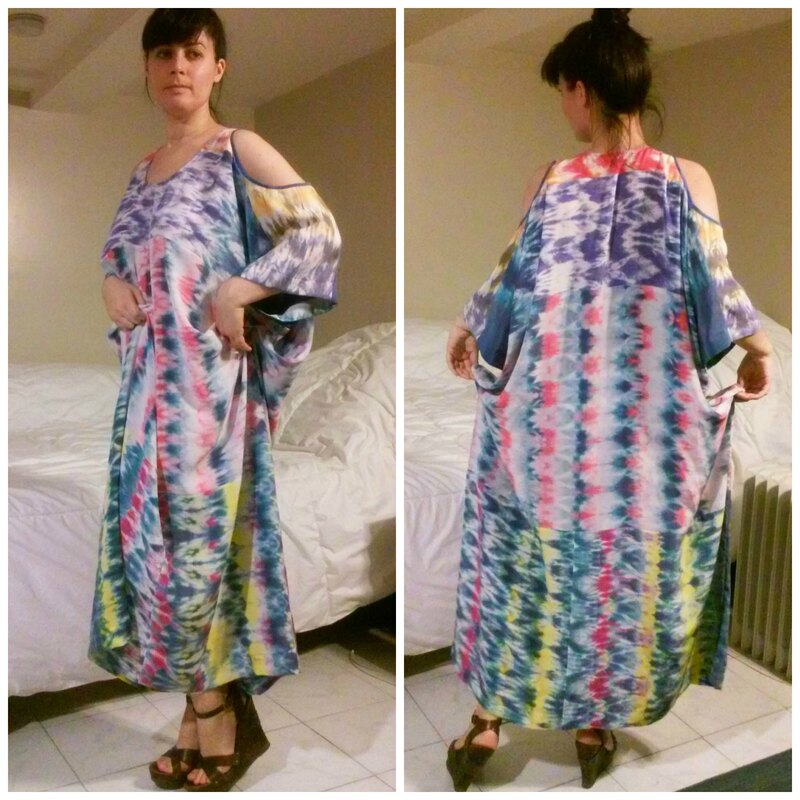 I decided to go with a long flowing kaftan with shoulder cut-outs. 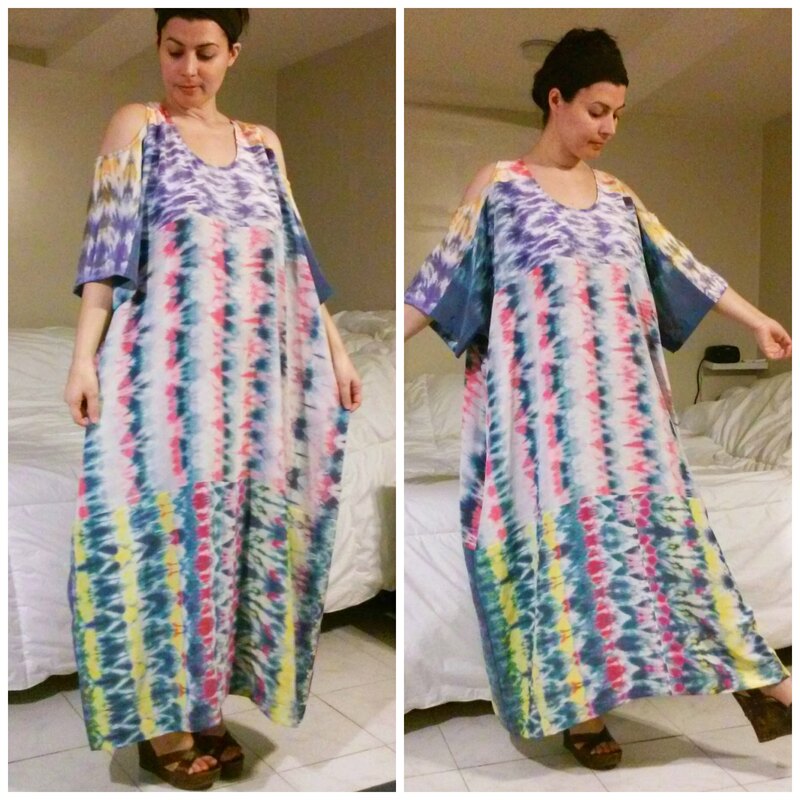 I like to keep the silhouette simple when the fabric is so colorful and kaftans are basically a rectangle with holes for your arms and head. I first stitched all of the scarves together to make two larger pieces of fabric, then cut out the front and back pieces from these. 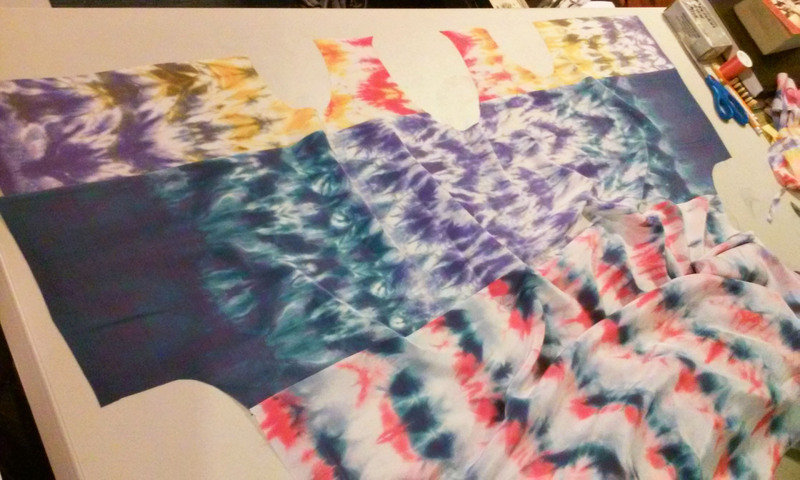 The front pattern piece of the kaftan. 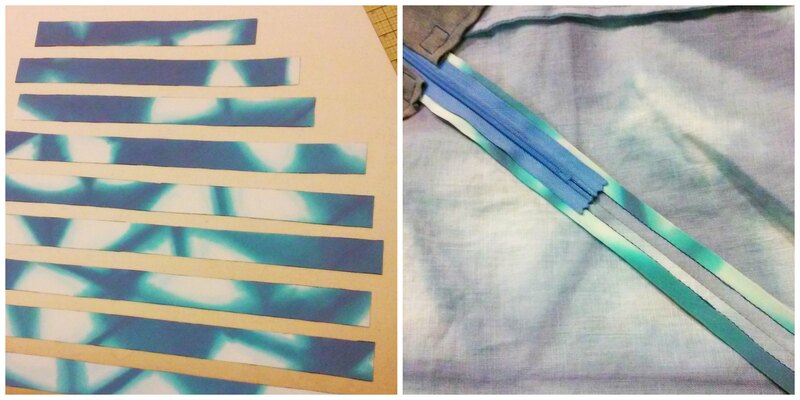 I sewed all of the seams with french seams. It does take a little longer because you have to sew each seam twice, but they look so nice when they are done. 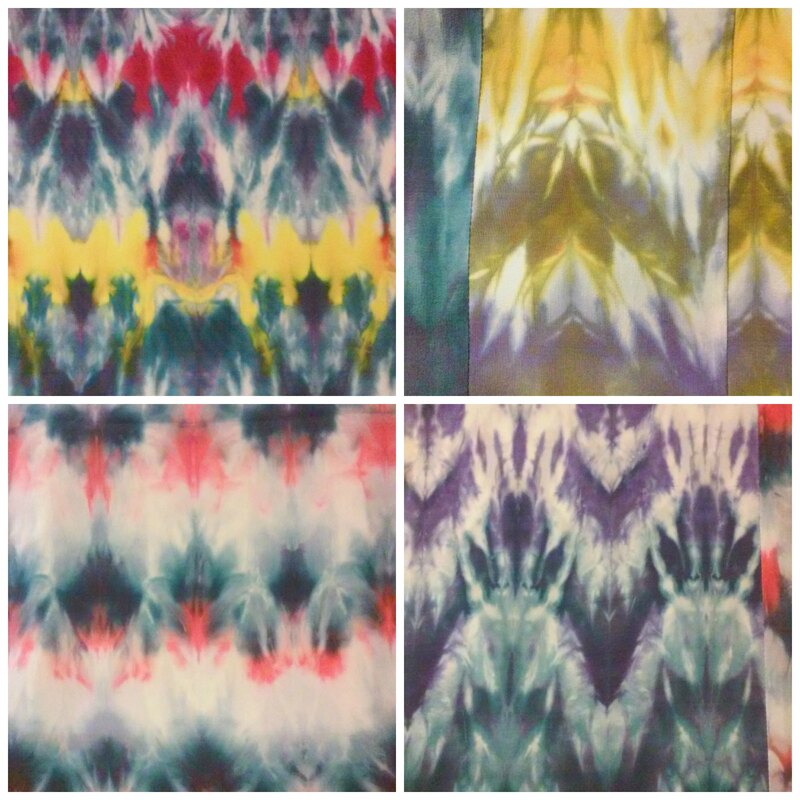 They make the inside of your garment look as good as the outside! I made the cut-outs a little bigger and finished them with blue bias binding. The binding added definition and the hint of blue picked up the blue in the rest of the dress. I think it tied the whole thing together! I can’t wait to wear this during the summer!